The 2016 presidential race has been called for Donald Trump. But Clinton won the national popular vote. This is the fifth time in history that the popular vote winner wasn’t elected president—a failure rate of about 10%. For most people—irrespective of political ideology— denying the national popular vote winner seems unfair. But our presidential voting method failures extend well past the national popular vote. Fortunately, we can fix it. And it doesn’t take a constitutional amendment. Step through this imaginary door for a moment where we have a national popular vote. That scene still has a lot of problems unrelated to the Electoral College. 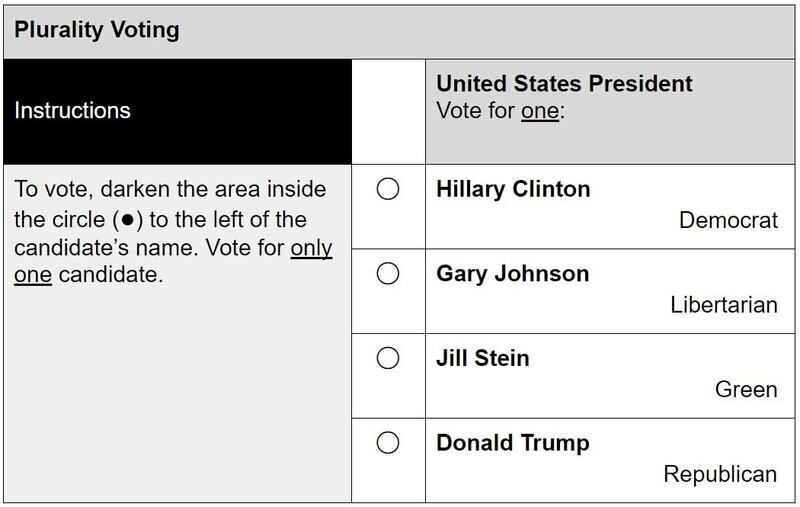 We use a voting method that forces all of us to choose only one candidate—plurality voting. And that plurality voting method causes a lot of problems. Here are the beginnings of that long list of problems. Plurality voting changes who wins because of vote splitting between similar candidates. Fewer people vote because they’re afraid of throwing their vote away, or they don’t like the lesser-of-two-evils dilemma. Plurality creates a shallow pool of candidates by shunning away other good candidates who fear a spoiler label. The media gives horserace-style coverage to the two major candidates and excludes others. They do this because our plurality voting method gives alternatives an artificially low reflection of support, making it easy to marginalize them. That distorted reflection of support under polling with plurality voting is also a criterion that debate commissions use. That’s how they rationalize excluding independents and third parties. And elected major parties pass draconian ballot access laws to prevent other candidates from running. They do this because plurality voting breaks down so easily when more than two candidates are on the ballot. None of that has to do with the Electoral College. And it’s of far greater consequence. If you had just the national popular vote, then all of that would still be a problem. You can’t ignore it. We have to get rid of plurality voting. Every voting method has its hangups, but there is one easy approach that would substantially address all these issues. 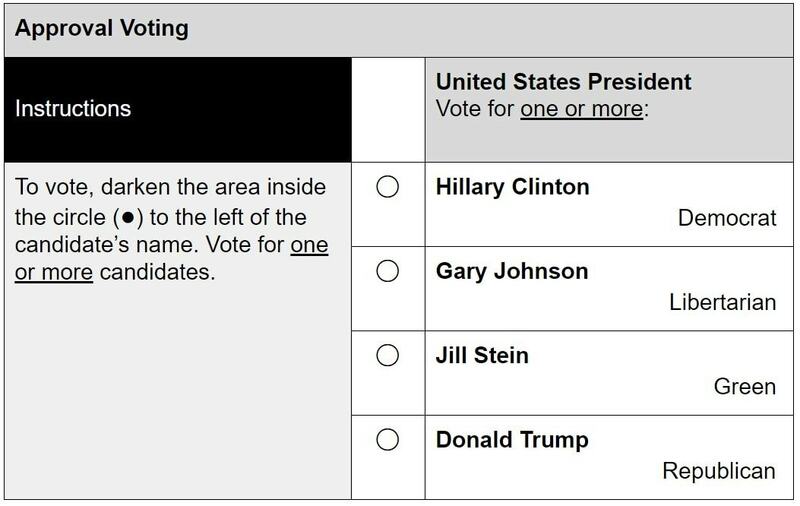 This voting method is called approval voting. Instead of choosing just one candidate, you choose as many as you want. Most votes wins. There is no ranking. Just choosing. You can always vote your honest favorite no matter what and the overall system tends to elect more moderate winners. Because we’re working within the existing framework, let’s start with an Electoral College refresher. Every state gets as many electoral votes as they have senators and House representatives combined. This means that every state (DC, too) gets at least three electoral votes. Because of this, the voter-to-electoral-vote ratio benefits smaller states, giving those voters from smaller states as much as three times the weight as voters from larger states. “One person, one vote” doesn’t apply to the Electoral College. The principle is grossly violated. There’s a lot more that can be said here about the Electoral College and its failures, but let’s focus on solutions. One attempt is the National Popular Vote Plan, which uses an interstate compact. That’s just a contract between states. It triggers states to assign their electoral votes to the national popular vote once enough states sign on so that their total electoral votes are at least 270. But it still leaves us with the worst voting method there is—plurality voting. To be clear, states can make their own laws that affect federal elections so long as the law doesn’t conflict with federal law. This means an interstate compact would work. If we’re going to fix this though, let’s do it right. Here’s how a compact allowing for a national popular vote with approval voting would work. Everyone signing onto the interstate compact would have to use approval voting. The compact triggers immediately. Electoral votes are assigned to the approval vote winner only among states signed onto the compact. Once states signing on hit 270 electoral votes, then the compact states have their electoral votes go to the national popular vote winner. If separate compacts exist with the same language and their electoral votes combine to 270, then they automatically merge to trigger a national popular vote. There’s a lot going on here. To address a partisan collective of states, this plan allows multiple compacts and joins them automatically at the 270 vote threshold. This automatic merging also makes it easier for voters in holdout states with direct ballot initiatives. They can put the plan to a public vote in their state. Additionally, this plan accommodates states outside the compact using plurality voting. The plan can even be written to roughly accommodate other voting methods if an outside state decides to experiment with something else. As a quick dismissal, note that the alternative of ranked-choice voting would not work because its ballot data needs to come together at one location, a logistical nightmare with this approach. Besides, approval voting is better anyway. A presidential election with approval voting would be completely unlike what you’ve seen in this election despite being strikingly similar to our current ballot. 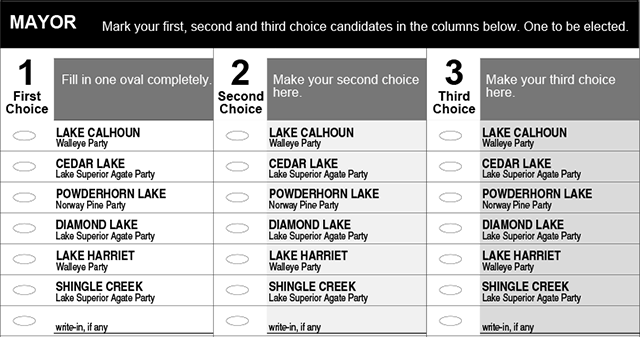 Being able to choose as many candidates as you want permits you to always vote your favorite. No matter what. Polling studies have consistently shown that approval voting favors moderates and gives a much more accurate reflection of support for third parties and independents. Further, it would encourage more qualified candidates to run because there’s no worry over the spoiler label. Enticing, right? Later this month, we’ll finish our initial analysis from our national presidential polling study on alternative voting methods. This includes analysis on approval voting. You’d be amazed at how much elections change when you move away from using one of the very worst voting methods.